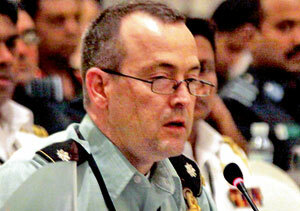 Senior Sri Lankan military officers, who had played a vital role as field commanders during the humanitarian operation, found an unlikely ally in the US Embassy's Defence Attaché Lawrence Smith when a question was raised about the alleged move by some LTTE leaders to surrender during the last few days of the war in May, 2009. The matter came up for discussion at the seminar on "Defeating Terrorism-The Sri Lankan Experience." The Defence Attaché intervened after an Indian delegate Major General (retd) Ashok Mehta who had served as the IPKFs commander in Batticaloa and Ampara in 1987 queried about the alleged surrender moves by LTTE cadres, now the subject of intense debate, locally and worldwide. This is what Lt. Col. Lawrence Smith had to say. "Hello, may I say something to a couple of questions raised. I've been the defence attaché here at the US Embassy since June 2008. Regarding the various versions of events that came out in the final hours and days of the conflict -- from what I was privileged to hear and to see, the offers to surrender that I am aware of seemed to come from the mouthpieces of the LTTE -- Nadesan, KP -- people who weren't and never had really demonstrated any control over the leadership or the combat power of the LTTE. "And I think the same is true for the version of events. It's not so uncommon in combat operations, in the fog of war, as we all get our reports second, third and fourth hand from various commanders at various levels that the stories don't seem to all quite match up. But I can say that the version presented here so far in this is what I heard as I was here during that time. And I think I better leave it at that before I get into trouble. " Trouble he has nearly got into straightaway. In Washington, no sooner he made these remarks (which were published in the local media in Colombo) the US State Department tried to disassociate itself with Lt. Col. Smith's off-the-cuff remarks. The State Department's Deputy Spokesman Mark. C. Toner was to answer a string of questions, planted or otherwise. This is how the Question and Answer session went. MR. TONER: Right. You're talking about remarks that were made at a conference in Colombo? MR. TONER: Well, just to clarify, the U.S. did decline invitations to participate in that conference as either a conference speaker or panelist. My understanding is that the defense attaché was there as an observer and a note taker. His comments reflected his personal opinions. There's no change in the policy of the United States, and his remarks do not reflect any change in our policy. MR. TONER: Personal opinion. The United States - and just to reiterate that policy - remains deeply concerned by the allegations in the panel of experts report, and we're committed to seeing a credible accounting of and accountability for violations of international human rights law and international humanitarian law. And we believe that the Sri Lankan Government must act quickly and credibly to address these allegations. MR. TONER: I don't have his name. MR. TONER: I believe he's still there, but I'll try to get an update. One can only hope Lt. Col. Smith won't face a General Court Martial for telling the truth -- even if it went against US (State Department) policy. It also clearly, shows how the Pentagon (US Defence Department) and the State Department have two prisms through which they see the wars of the world. The high commissioner and ambassador designates and several of the new appointees to Sri Lanka's various missions abroad were given a taste (literally) of life in the diplomatic service when elegant (and tasty) canapes were served with tea, coffee and soft drinks at Temple Trees when they met President Mahinda Rajapaksa before they embarked on their missions abroad. The President asked those gathered to promote investment. But the fact that the investment zone near Katunayake was on fire at the time must surely have been burdening him. But what caught the attention of the assembled diplomats-to-be was a remark by the President's Secretary. He said this; "ingriseyen kiyamanak thiyanawa ' a diplomat should lie abroad' kiyala. mama dakina vidiyata nam, thanapathi kenek rata wenuwen, rate keerthi namaya wenuwen, boruwak keewata eke athiwaradak nehe". We shall not translate this. This is only meant for us Sri Lankans to know. Police work outsourced to UPFA MP’s thugs? The JVP's protest against the proposed private sector pension scheme and the killing of a factory worker was in full swing on Thursday at Lipton’s Circus. 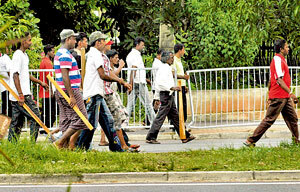 A few hundred metres away a UPFA MP from the Colombo District was leading a group, some of them carrying clubs. JVP MP Anura Kumara Disssanayke called Colombo's DIG Anura Senanayake who was on duty around the Town Hall area. He inquired as to what these club-wielding people were doing there. The DIG's response was that they were present to prevent any one marching towards 'Temple Trees', the official residence of the President. Mr. Dissanayake was quick to ask the DIG whether the task of preventing protest marches had been 'outsourced' by the Police. The UN High Commissioner for Human Rights Navi Pillay, who continues to take an unrelentingly tough stand against Sri Lanka, has apparently written to Secretary-General Ban Ki-moon, summarising comments made on Sri Lanka by some delegates at the Human Rights Council in Geneva. She has also asked what further steps are being taken following the UN Panel of Experts report. The External Affairs Ministry is livid that no such request has apparently been directed by her to the Secretary-General on most other countries that have come in for similar negative comments, including NATO actions in Afghanistan. One ministry source says: "One wonders what bug is buzzing in her bonnet when it comes to Sri Lanka? Are her actions totally objective and unbiased?" The lone sentinel who defended the integrity of the President of Sri Lanka and its Armed Forces seemed a little camera shy nevertheless as he was snapped by a participant at last Friday's screening of a film on the purported crimes committed by soldiers in the last stages of the war against the LTTE in May 2009. 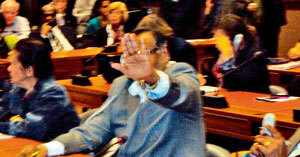 The screening of the British Channel 4 video, neatly timed whenever Sri Lanka is on the dock at some international fora or before a debate in the British House of Commons was organised inside the UN premises in Geneva by Amnesty International and Human Rights Watch. One of those who had attended the screening purportedly showing Sri Lankan soldiers executing LTTE cadres with their hands tied behind their backs said this; "I don't know about the authenticity of this video, but YouTube is full of executions of captured German soldiers by US soldiers not so long ago". 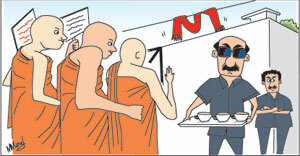 Buddhist student monks of the Inter University Bikkhu Federation on Friday held a protest march to Temple Trees. Initially, road blocks had been placed, but when they approached the precincts of the President's residence, the barricades were removed and they were told by a senior police officer on duty that they could go ahead with the march right into Temple Trees. There, the protestors were in for another surprise when they were offered 'gilan pasa' (a soft drink or tea that is offered to monks) while officials from the President's Office were at hand to speak to them. The angry student monks had declined the offer, but one of them remarked that if the same courtesies were offered by the Police to protestors there would have been no necessity to protest and at least the young factory worker's death could have been prevented.